The Jordan XI "Space Jam", one of the best known sneakers of all time, will grace us again this year on November 27th 2009 as a Quickstrike. The Jordan 11 was first seen during the 1995-1996 NBA season on Michael Jordan's feet, when he won the championship with the Chicago Bulls. 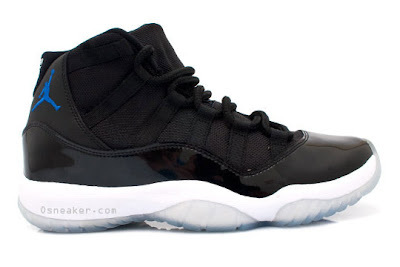 The sneakers then appeared again on the blockbuster "Space Jam", released in 1996. Bookmark the date guys, seriously. You might as well name it a double Quickstrike since its already well known that these sneakers will fly away - FAST.